Leaders unconsciously follow learning habits that limit their potential. Your preference for one learning style enables you to become an individual contributor – a specialist. But leadership demands broader scope, deeper capacity, and profound confidence. Expand your leadership by learning how to learn. Your learning style consists of habits that have made you successful in limited situations. But learning styles are not fixed traits. Extend your learning styles – expand your leadership capacity. The way you learn is the way you lead. Learning flexibility – the ability to use 9 learning styles – enables confidence and freedom to expand your scope, extend your influence, and increase your effectiveness. The nine learning styles incorporate the whole person in learning. They also provide sequence to any learning situation. Improve your learning. Improve your leading. #2. Be open to novelty. #4. Organize your thoughts and environment. #5. Use facts to make independent judgments. #6. Commit to achieving practical results. #7. Take a small step now. #9. Be adaptable enough to pivot. Each learning practice enhances another. Each question accelerates your effectiveness and expands your comfort zone. Flexible learners reach their full potential. How might leaders become better learners? 20 free copies of How you Learn is How You Live. Eligibility limited to the Continental U.S.
Kay Peterson is managing director of the Institute for Experiential Learning and a founding partner of Harlan Peterson Partners, where she uses Experiential Learning to help professionals become exceptional owners, leaders, and entrepreneurs. This really made me think and that is always good. We need more thinking in the world! Thank you. How might leaders become better learners? Paying attention to others actions has helped me tremendously. “Don’t believe anything you hear and only half of what you see” is an old cliche’ that works, at least it will make you think to see the whole picture. It’s not always Black or White but we sure can get a lot of Gray areas. Never be afraid to ask questions, it is a great way to learn! Yes! It’s great to have as many “weapons” in your learning armamentarium as possible! May I add one more? #10 – Listen before speaking. I find that the best leaders make a concerted effort to truly listen to the message and, sometimes more importantly, the underlying message, being conveyed by members of their teams. You can learn so much this way. These nine principles come with a mindset of lifelong learning. Thanks for the post! This article is right on point! How often as leaders are we deliberate in actual leading? I have early on in my career just done the necessity never thinking about expanding my abilities. Now as a seasoned leader I try to be deliberate in my ability to lead. These practices are just we need as a guide to successfully lead. Thanks! This is great advice, we should be open to new ways of learning, this helps to expand our possibilities along with assessing how the new way is working in conjunction with making the necessary adjustments to lead teams and projects. #3 – Pause to Reflect may be the toughest for Leaders who are ACTION ACTION-oriented. I am interested in learning more about the 9 learning styles. I thought there were only 7. Hopefully I can win a book and learn all about it. Flexibility is key. Being flexible makes you more open to change, expands your opportunities and allows a work/life balance. Excellent tips! I’d love to read this! Hope I win! Hello, I am a “Gallup” learner but actually never reflected on my “learning strategy”. Sounds crucial for future leaders in an environment which requires constant learning. I would love to get some bundled advice on how to get the personal and maybe organizational strategy to learning right. Really Good questions to drive habit building. We often gravitate toward the “easy” questions; the ones with which we are most comfortable. Taking the time to identify which ones are a challenge for us, and investing in expanding our thought processes in those areas will greatly equip leaders to expand their borders of influence and success. 10. Have a gracious attitude. I love the pause to reflect portion. Often times, as leaders who’ve built our careers on inkvidual successes as knowledge workers we are too quick to react to questions or prove our worth. Being able to take a step back and reflecting can sometimes be the pivotal moment in leadership growth. Great post! This is a great list, I love that they build on each other and creates a pattern for life long learning! giving clues as to what is important to them. I would also add to that list be truthful. Asking questions like how do I know this is true when looking at data whether from internal or external sources. I particularly like 7, 8, and 9. Good stuff! I’m interested in more information about the styles. The questions especially are interesting. This is a great lesson on how flexibility is key to a leadership role. I admire the fact that you identify the importance of being flexible with learning but also with leading. I work in a healthcare setting where nothing stays the same. I would not be able to thrive if I did not constantly work on being understanding and flexible. Thank you for the reminders! Some great points and questions. Normally being mindful isn’t something I’ve needed to do, it’s generally natural, but lately I’ve found myself whether reading, studying or listening to others thinking about other things. I’m pretty sure this is stemming from a less organized desk and calendar. Tweaking… Thank you. Sounds like an excellent read, needing reinforcement! How about making the 9 items into a poster?? What a great list! Being mindful is the first step to any learning! Does your book explain what an “armamentarium” is? Sorry, found that in reading previous comment. I need all the help I can get! I did look it up; so, learned a new word today. This is a great list to live by, whether you are a leader or parent or coach. #9. Be adaptable enough to pivot resonated with me the most. Agility is important, especially in this fast-paced environment of today. I shared this clip with other leaders so we can have a quick chat about what we agree with and how we put these tips into practice. Very thoughtful, I especially like #9 in that is asks are you flexible enough to pivot when priorities change. Most people are inflexible or are to slow to adapt as the situation or priorities change. Fantastic reminder of the value of pondering / review / planning. Interesting….in my work of SOX and PCI compliance, so much is happening so quickly, often with great potential for a mis-queue to go very badly, I often ponder “the situation”. lol lol…and I’ve often questioned myself as to why I ponder so about “the situation” at hand. –“Why do I have to continually stop to question, to ponder? ?”, I would ask myself. This reinforces for us the value of pondering, evaluating, re-tooling, for the next challenge (next meeting, next interaction??!!). Thank you for this post. We simply must not turn our backs on “common-sense and basics” in our day-to-day work–our day-to-day quest to make a difference as a result of our work. Based off of how many have made note of #9 and our need to be flexible, we should give that great value. I use to think being flexible was hearing what others said even if I had not intention to give any value to their input. Flexibility is critical if you are going to lead. Most important is to consider that as a leader you may be wrong and need to acknowledge that. Wonder how many old schoolers heads just exploded? Great information. I believe one of the biggest mistakes made when trying to learn new material is the failure to stop and reflect on the possibilities of the whole picture. Good post. I am always working to keep my self fully present in every situation and not let myself be distracted. I think aging tends to make us less open and adaptable. These points help reverse the flow of aging! My signature reads: ““Every man is my superior in that I may learn from him.” ― Thomas Carlyle. If we all lived and lead this way, our world would be an infinitely better place! Good stuff! Thought provoking and foundational. Thanks! I love the last line- “flexible learners reach their full potential.” I am a high school teacher and football coach and I’ve unfortunately met too many older professionals in this job that cannot adapt. They were once very successful but all they know now is “what I used to do” – referring to what worked 10-20 years ago but clearly hasn’t worked well for them in the present. I’ve been lucky to experience some success in my young career and I really hope I never fall into that trap. Thanks to articles like this for continuing to remind me to constantly stay flexible and always be learning. Great questions to post on your cubicle/office wall. When you have time to think, these are very strong. If you get caught up in the daily whirlwind of the “reactive-now” it will take focus, determination and intentionality to get to these. If I could only get a tiny “consultant” on my shoulder to whisper these in my ear when I need reminded of them the most would be very helpful. lol. I’m in Canada, don’t include me in the book draw. Very interesting! My take away is that what your learning style is will work with others who share that learning style but in order to be a well rounded leader you need to be adaptable to others learning styles for your growth and theirs. Being willing to learn about and expand my own learning style has helped me seek to understand the learning styles of the people I lead. Dual win there! I love this, and really need to learn more. Great post with realistic and thought provoking questions. I think in today’s age every thing is moving so fast and we get used to make quick decisions based off previous results. As you have pointed out, there is much more to learn to be a more effective leader. These questions I know will be important for me to ask myself as I know that I have to continually strive for more opportunities to be a better leader. That won’t happen if I don’t take the time to think deeply on those questions. Thanks! This list of questions and practices clarify the importance of context for understanding and developing leadership. My early leadership training came from the military and the police. They taught me how to value practices 3 through 9. Later, the church and leaders from other cultures to taught me the value of questions 1 through 3. Context is important. Thanks Dan! 6, 7, and 8 are in my current workflow. Looking forward to putting in the rest. I struggle with #3,seeing the big picture. All are noteworthy. I’ve never considered a correlation. Great points. At a creative conference workshop I attended, the facilitator mentioned that employees outside either his ad agency and/or client creative/marketing/sales departments would be invited to brainsqualling sessions. They had no preconceived notions, were not immersed in the brand or product, and offered feedback that could relate to the consumer/end user. They provided learning opportunities for the leadership teams. This is a great point. One might also ask AM I seeing the whole picture? Another way to learn how to lead is by example. Pick someone whose leadership has had an effect on you and emulate that person or that habit. Or ask them to mentor you, so you can also see the thought process involved. Focusing on mindfulness is helpful but hard! I think all of the point listed are excellent ones. Hopefully we will see the next 11 tomorrow. I believe #9 (Being adaptable) is one of the most important facets to growing as a leader. The cliché, “If you always do what you’ve always done, you’ll always get what you’ve always got,” is absolutely true. If you remain stuck in the same style of learning, you leave yourself ill-prepared to face new challenges. Biggest challenge for me is being reflective and making sure I am seeing the whole picture and not being tunnel-visioned. Great post! All the comments are good points for any leader. I like #7 because we often are fearful of new projects till we break them down and take one step at a time. Great points. Learning how others learn will help you develop them as well. Not everyone learns the way you do. This is a great list of questions to ask yourself every day. I agree this needs to be posted on my cube wall. Thanks for another great post. Kay, your method of applying 9 styles, 9 questions, and 9 daily practices is an ingenious way to “expand your leadership by learning how to learn.” It combines self-awareness with situational awareness and emotional intelligence with IQ to engage and lead in thoughtful, insightful, and productive ways. Thank you for so elegantly tying these concepts together in the form of practical leadership development! Very nicely done! A great add for leadership coaching questions. Learning, to me, is not focusing so much on what people do as much as it is why they do it. I try to ask “why?” as much as I can so I can learn how others think. It’s not wise to carbon copy someone else because everyone is unique. However if you learn how others think, add your own thoughts to it, eventually it become your version. That’s what has helped me. These are excellent points. I am going to share this blog with my coaching clients who want to be better leaders. I think it will give us a great deal to discuss. Thank you for sharing! I could see an app that zaps me one of those questions to ponder at the start of day! Thanks! These questions are so helpful and help guide my thinking in the direction of being mindful and present in any situation (versus on autopilot and thinking in the same patterns), gaining confidence and increasing my effectiveness in all situations (at work and in my personal life). Thanks for sharing. The best leaders are the ones that stay curious. Those that want to develop and challenge themselves will do the same for others. A great list, Kay! Focusing on the practical has paid dividends for me in the past and I could not agree more that you learn to lead based on how you learn, also taking a small step, just get moving. Look for learning when you are stuck or frustrated. This topic seems to have generated a lot of thoughts. As I gain experience I find myself listening and reflecting more. This has also allowed me to appreciate the novelty solutions and take greater risks. Schedule learning so it does not fall by the wayside. Set aside time to address the questions here. If you have to leave your usual spot to do that then so be it. I always include sessions for my professional group in my schedule and try to schedule training that my organization provides. I am happy if they reinforce present knowledge but I do look for opportunities that are outside my area of expertise or concern. “Profound confidence.” Wow. That’s a lifetime achievement goal! Thanks for breaking it down into simple steps to put into daily practice. I read with great interest the 9 learning styles. I wonder if they really are always sequential or could they be interchanged based on situations. I guess I need to read the book. Many years ago I read a book called 7 Laws of the Learner. I wish I still had that book to see if there are any similarities. Kay is a visionary leader and this book great insights for continuous development. People do lead how they LEARN! I feel people stop learning because they stop feeling curious. I appreciate the use of guiding questions to help engage in inquiry regarding our work. Great advice! Would like to learn more ! 9 great tips I will utilize in my morning team pull ups and monthly staff meetings. Thanks! #7 seems to help me all the time. Doing things in chunks is still forward progress! 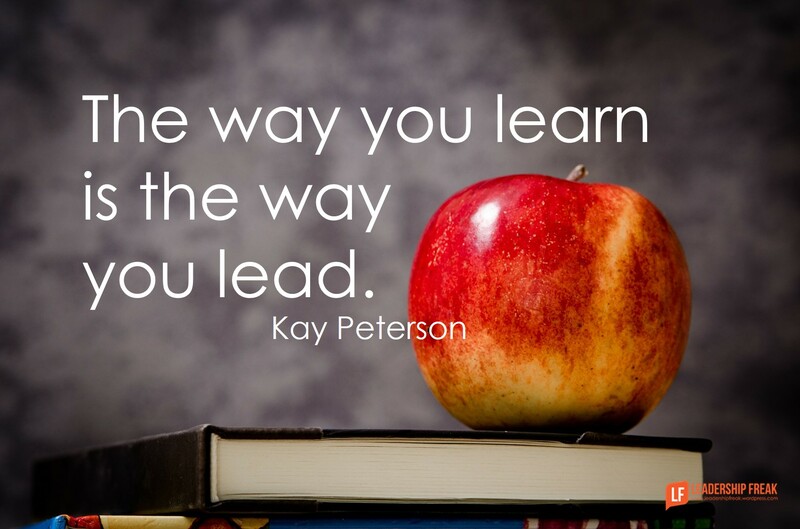 I love these blogs and want to learn more about the way you learn is the way you lead. I also hope to receive a free cooy of how you learn is how you live. Love # 8. Thanks for the insight!!! Excellent list, but perhaps we can live the list by probing into the underlying principles of learning to live and lead. One principle might be humility. For example, if we practice humility, we may be more likely to develop habits of mindfulness, openness, and adaptability. Is a second principle commitment to action? #7 – Take a small step now. Often we are afraid to take the first step because it seems like it is so small. But courage to take the first step will help us take the next steps. “How can I adapt when priorities shift?” Is a hard one for me after working through questions before it and coming to a conclusion. Working on that by trying to include people it may affect ALONG THE WAY instead of once a decision has been made. Leadership is most effective when you have more Questions than Answers. It’s great to have specific questions to ask ourselves to prompt learning. It feels like if our reflections are too general, we can miss significant learning opportunities because we don’t know where to look for them. How can I adapt when priorities shift…and “flexible learners reach their full potential” really hit me. An excellent list to remember that leaders continue learning on a daily basis. When a person stops asking questions, then learning quickly stops. I would add a 10th question: Does integrity affect my leadership? Liked today’s post! Quite interesting. Leaders need to listen to others and keep updated on the industry development. They need to be focused and stick to their visionary goals with a close eye on the competitors’ likely moves to disrupt the market conditions. These are outstanding questions! It is amazing how many “leaders” don’t actually do these things and simply rely on their position or prestige to try to influence others. This is why leadership is not about titles. You cannot be a leader without constantly learning and improving. It is important to broaden our perspectives but it is also important to reflect on what we learn and decide if it falls in line with our principles and values! I believe that this is spot on. The value for me is that if I learn in a particular way others do to so to lead the way I learn will serve others. As leaders, we all have our professional learning style and habits. What about trying some new places to learn? If you only read research, why not try some professional blogs, or follow a hashtag on Twitter? What about the learning people like you curate on Linked In? Why not create a Twitter list of great thinkers and leaders to follow, and check out that feed for 10 minutes each day? Switch your sources of information around to discover a whole new world of learning that helps you burst your filter bubble! Learning flexibility is really important and something I would like to explore more. I think learning styles are important but challenging myself to be more flexible in how I learn will make me a better leader and help me understand the people I lead better. Great stuff here. Got to be open and reflective! Thanks. OK – you captured my attention. I look forward to reading the book. Great, thought provoking questions! Flexibility and reflection are a commitment. I’d love to win this book read it and then gift it to an upcoming leader on my team. Great article! I REALLLLY would LOVE to read this book!! The concept is so basic but so thought-provoking at the same time! Thanks for sharing Dan. Added this to my reading list (in case I don’t win a copy) as I am very interested in learning about the 9 different styles Kay references. Thanks for a great blog and a great post! Often times in instructor courses, they have you fill out an evaluation for your preference for instruction. I wonder what would happen if we took one of the evaluations given during a leadership course to find your leadership style and measured it against your learning/instructional style and see how correlated they would be. If so, that would be a powerful way of taking the literature in this area farther. Ask yourself the questions, find out how you learn, then become a better leader through self reflection. Nicely done Kay! I have found the power to pause and reflect to be invaluable. I’ve begun proactively reflecting before I begin my day. I think about my calendar and what interactions I might have. Then I consider how my behaviors may impact those interactions. This has improved my awareness and given me great insight into how I lead. Great post. I agree and I think the points included are relevant for the new skill set that is required for effective leaders in today’s workplace, which calls for greater emotional intelligence and less reliance upon technical skills. Thanks for the additional insight. I am a new manager for my employer and want to become the BEST leader I can be. I need all the extra help I can get!!! Didn’t know my leadership style was base on my habits. Great thinkers are great leaders…in example, the person who created this piece and method is a great thinker, and is now leading people toward the greatness. This is something much needed in the work place! Often, I see people with only a title suggesting they are a leader when in fact they are not leaders at all and they are not good thinkers either. A piece of paper and a title will never give you this. It’s already who you are. thanks for this very practical and do-able list. what a great reminder and guide for me to remember and DO!! I find I lead differently depending on the individual. Some employees I can be very direct with while others I have to be a little more gentle in my conversation. This could not have come at a better tie for me! I’m working on “Self-development” with our leadership team (managers & supervisors), and this will help tremendously! For me, mindfulness. Thanks for the super rad giveaway! What an amazing post!!! Loved each question!! that’s a great book title! Taking risks is so important – get out of that comfort zone!